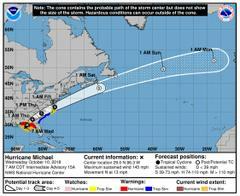 The Beaufort County Sheriff’s Office Emergency Management Division continues to closely monitor Hurricane Michael. According to this morning's National Hurricane Center advisory, the storm is in the Gulf of Mexico moving north at 13 miles per hour and has maximum sustained winds of 145 miles per hour. Sheriff P.J. Tanner has scheduled a press conference for 1:00 p.m. today on the second floor of the Beaufort County Sheriff's Office Law Enforcement Center, 2001 Duke Street in Beaufort to address the storm's potential impacts on Beaufort County. Media: newspapers, radio and television are encouraged to attend. The press conference will broadcast live on the Beaufort County Sheriff's Office Facebook page https://www.facebook.com/BeaufortCoSO/ and YouTube channel—a link for YouTube will be sent out prior to the press conference. Beaufort County and neighboring coastal areas are under a tropical storm warning, which means tropical storm force winds are possible within the next 36 hours—tonight into tomorrow. In addition, the National Weather Service issued coastal flood and high surf advisories for our area through Thursday. Currently, there are no bridges closed or plans to close bridges in Beaufort County. 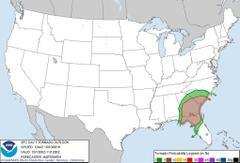 The Sheriff's Office will keep you updated on the storm and its potential impacts on our area. Please continue to follow official sources for information on Hurricane Michael and avoid misinformation spread through social media. Please tell your family and friends to sign up for NIXLE www.nixle.com to receive up-to-date information on matters of public safety. Thank you for your partnership and continued commitment to the safety of our community.